Gastroquin acute stabilizes water and electrolyte balance, and therefore has a positive effect on the consistency of the droppings. Probiotics like Saccharomyces cerevisiae support the physiological microbial balance of the large intestines. Vitamins and electrolytes lost during periods of diarrhoea will be supplemented by Gastroquin acute. In case of digestion problems (diarrhoea) during the first two months of life, foals are given 2 x 15 ml of Gastroquin acute / day. 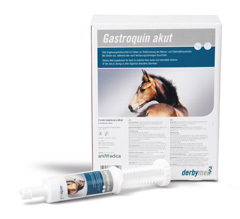 Older foals and adult horses are given up to 4 x 15 ml of Gastroquin acute / day. 1 – 7 days. It is recommended that veterinary advice be sought before Gastroquin acute is fed to the animal. Because of the higher Saccharomyces cerevisiae NCYC Sc 47 (4b1702) content of this supplementary feed, in comparison with a non-supplemented feed, it should be fed to foals and horses in a quantity of at least 0.4 % and up to a maximum of 2.0 % of the daily ration.